Position rack in the centre of the oven and preheat to 400F. Spatchcock the chicken (as shown in the above video). In a medium saucepan, combine the orange juice and pomegranate juice. Bring to a boil over a medium heat and reduce to 1/4 cup (about 15 minutes). Add 1/2 tsp. of the thyme, all of the cumin and cinnamon, and 1/4 tsp. pepper. Divide the mixture between two small bowls. To one bowl add 2 tsp of oil and 1/2 tsp salt. To the other bowl add the chicken broth, all but 1 tsp of the orange zest, and 1/4 tsp salt. Scatter the sweet potatoes, parsnips and onion over the bottom of a 10″ x 15″ shallow baking dish. Toss with remaining 4 tsp oil and 1 tsp thyme. Arrange the chicken, skin side up, on top of the vegetables. Brush with all the juice-oil mixture. Roast for 30 minutes. Remove pan from oven and reduce temperature to 375F. Pour the juice-broth mixture around the chicken pieces and scatter the nuts around the chicken. Return the pan to the oven and roast until the vegetables are tender and a thermometer registers 170F in chicken breast. 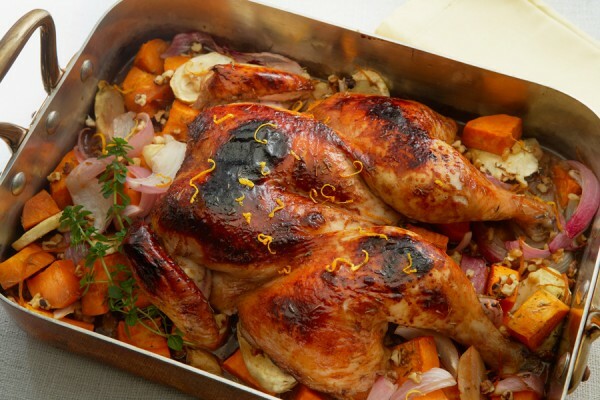 Remove chicken to a cutting board, tent with foil and let stand 10 minutes. Cut chicken into pieces and transfer to a warm serving platter. Use a slotted spoon to arrange the vegetables and walnuts around the chicken. Top with remaining orange zest, parsley and mint. Serve with rice or couscous. Variation: Instead of a whole bird, use 6 bone in chicken breasts or 6 chicken legs.